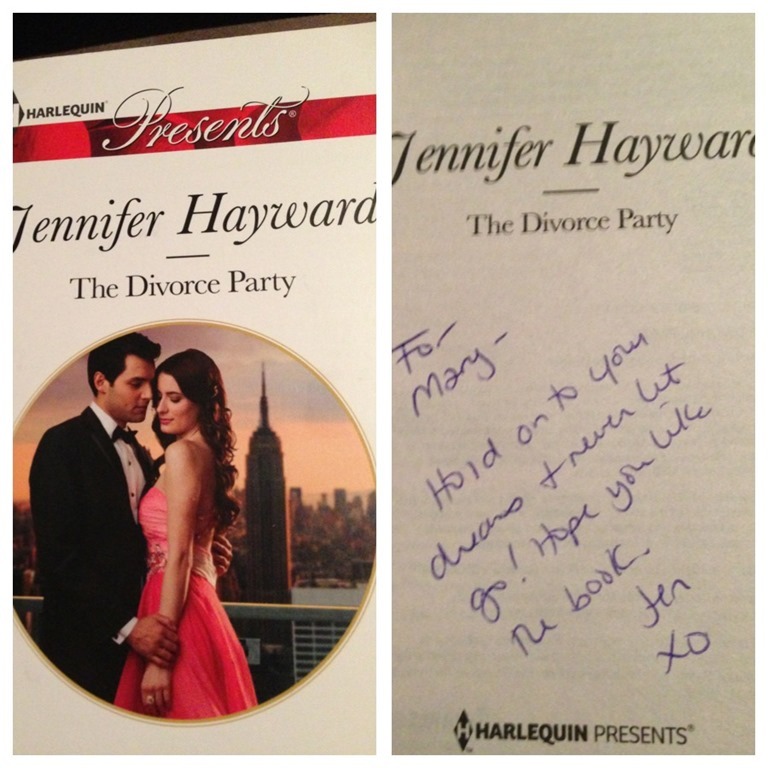 Jennifer Hayward is Harlequin’s newest author. 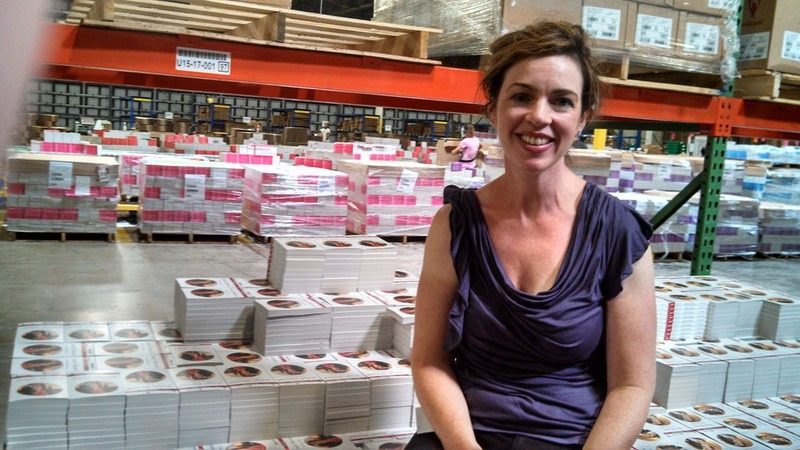 Her new novel, The Divorce Party, was just released as an eBook and will hit stores in paperback later this month. Jen and I used to work together until she decided to take more time to focus on her writing and fulfill her lifelong dream of being a published romance author. And she did it!!! Every time Jen posts a new update on Facebook about her book, I just want to ask her “how does it feel to have your dream come true?” It seems like such a cheesy question but it’s totally sincere. Jen’s lifelong dream has come true! What is that like? I decided to ask Jen out for lunch and find out the answer. We ate at Lola’s Kitchen on Church St. It’s really near my work but I have never tried it. Lola’s is delicious and I will totally go back and there are tons of options for people who are gluten-free. I had the California bowl with brown rice. It had tempeh, kale, nuts, avocado and veggies. It was really good, filling but not heavy. Jen had the special frittata with salad and she enjoyed it very much. We each drank water. Total bill was $30 with tax. While I like to try to keep quiet about anything I start in case I don’t finish, perhaps writing about it here will keep me accountable and ensure I go through it (or not, see podcast). Well might as well spill the beans. I am writing a book. I have said for years I was going to and now I am actually doing it. It’s a young adult novel, takes place in the future and involves aliens. And I hope it will be funny too. The reason I am telling you all this is because I talked to Jen quite a bit about it and she gave me amazing and helpful tips. First we talked about character development. She said you need to make sure that every main character has an external and internal conflict and you need to be overly obvious in presenting them to the readers. Second, I need to have a part in the book where all hope seems lost, where the main character appears to have no chance of overcoming their conflicts. Finally, we talked about outlines. I am currently working on mine and it is extremely detailed as I want to make sure that I know what happens to each character and plot line throughout the book. I am actually using a script outline technique I learned in university to lay everything out. Jen told me that while it’s important to outline the story, you don’t have to include every detail in the outline because a lot of the story comes through as you write and a lot of the outline will change. Jen recently finished a book that she completely re-wrote the ending three times before she knew she had it right. Basically be organized before you start writing but let the natural writing flow come through. Leaving lunch I was even more excited to write. Jen first submitted a novel to Harlequin when she was 20. Although they didn’t publish it, she did get feedback. They let her know that this wasn’t the right story but they liked her writing and encouraged her to submit a different manuscript. Any feedback at all is pretty amazing considering many hopeful authors only receive a form letter. Years later, Jen decided she needed to write that new novel. At this point, she was working full time and had a family. She decided to cut back on her hours at work and fully commit to her lifelong dream. She wrote several different stories but it was her entry into Harlequin’s So You Think You Can Write contest that got her the publishing deal. The contest has writers submit the first chapter of their novel online and the public votes. Jen made it to the final three, submitted her full manuscript and then won the whole thing. 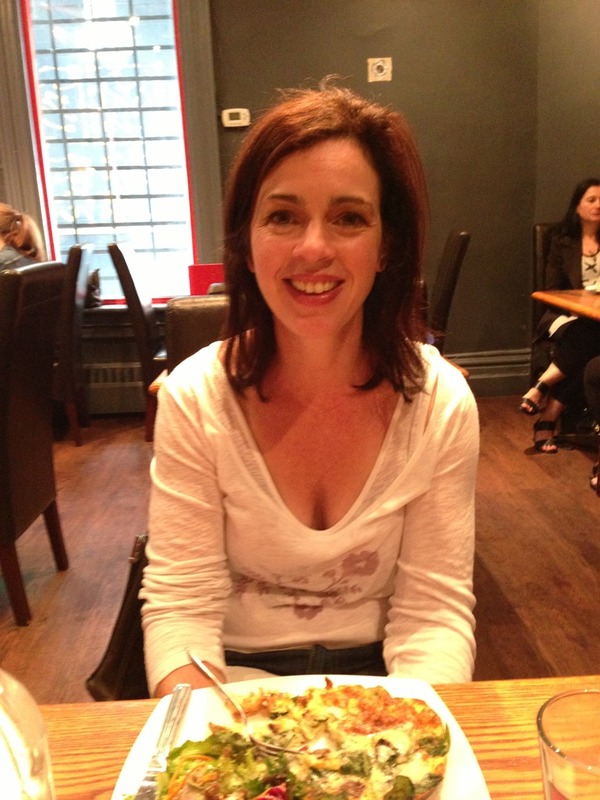 With winning the contest, she received a publishing deal for the book she entered, The Divorce Party. But it didn’t stop there. Harlequin so enjoyed her story, they gave her a second book deal right away. But it didn’t stop there either. As Jen’s dream continues to come true and she continued to submit manuscripts, she now has a six book deal with Harlequin. As mentioned in the beginning, I wanted to ask Jen what it feels like when your dreams come true. I think that often about Olympians. Like Tessa Virtue and Scott Moir winning Olympic gold at 20. So you’ve worked and dreamed for your entire life to achieve this one goal and you’ve achieved it. So now what? First, Jen told me the whole thing is still surreal, which is not surprising to hear. I mean how could it not be? Jen says that when the book comes out in paperback is when it will really hit her, when she sees her book on the shelves at Walmart, Indigo, Shoppers and more. I can’t wait to see it myself so I can only imagine what it feels like for Jen. And then she told me something that was the true answer to my question. When your dream comes true, you make a new dream! Jen has always wanted to see her name on the New York Times bestseller list. Well I hope she gets there. If this six book deal is any indication, I think it’s only a matter of time. Go Jen! Jen sitting on a pile of her book!